Car Art! Check Out This Ford Fiesta Transformer! Final Product Is Amazing! - Muscle Cars Zone! Car Art! 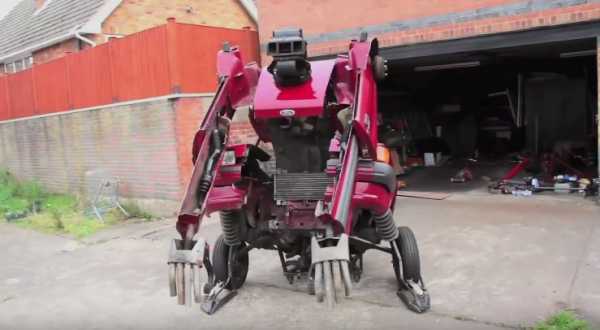 Check Out This Ford Fiesta Transformer! Final Product Is Amazing! We do not know how much of an art soul you are, but we suppose you will like this one since you are a Gearhead already! You know cars and you know how hard it is to do a simple engine swap or install new wipers! By knowing all that, you know that it is an even bigger deal to make a sculpture out of cars! Now that`s real CAR ART! Well, that`s exactly what these guys did! Friends that know their business broke into pieces a Ford Fiesta and turned it in something that looks like a Transformer sculpture! Definitely a car art that one would like having in his room, yard and even living room! If you have the time and money, it is always cool to experiment on stuff! For example check out this AMAZING ARTIST that transformed his Ford Fiesta into a ROBOT! We know the whole wide world is stunned by the Transformers movie, but this one is apparently too much of a fan!!! However, feel free to walk into his garage and watch him and his friends as they work on their PROJECT! You will hear a few words from the producer himself, but you are probably more interested in the FINAL PRODUCT! The producer will explain how they formed their team, what their final goals were, and what they did to perform this car art! How did they come to the idea to transform a Ford Fiesta into a transformer sculpture! You will find out everything that bothered you about this car art! Which we must say, is AWESOME! What a GREAT JOB!!! Check out the video below and feel free to share your comments and opinions! Finally, if you want to see this Japanese transformer robot that can transform into a sports car, follow this link!